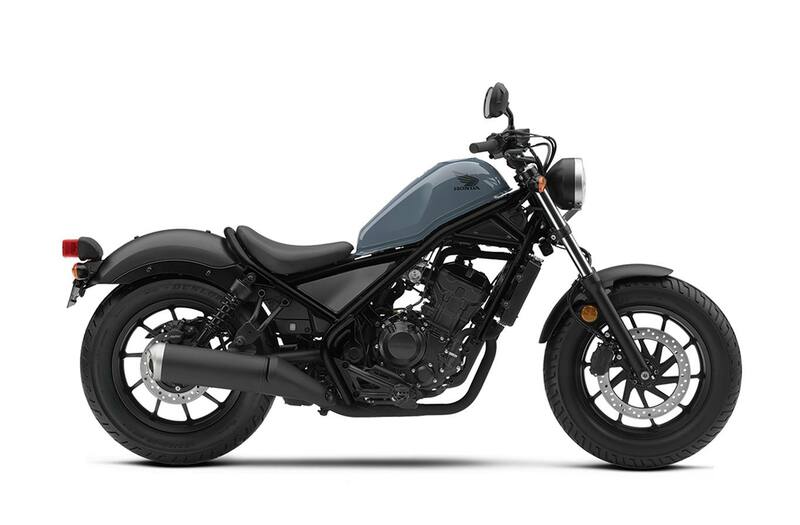 Tuned for cruising: The engine's high-tech features and light and compact design contribute to the Rebel's impressive power-to-weight ratio, allowing it to compete with twin-cylinder bikes of similar displacement. Special tuning accentuates low-rpm horsepower and torque, making the Rebel perfect for bopping around the city. Prior year model shown. High-performance credentials: The 286 cc single-cylinder engine boasts dual overhead camshafts driven by a Hy-Vo-type silent chain, forked roller rocker arms, a compact four-valve cylinder head, a counterbalance shaft for smoothness, and liquid cooling for optimum performance and durability. Fun to ride: The engine produces a remarkably broad torque curve for strong low-rpm performance, and peak horsepower kicks in well below redline. This wide spread of power makes the Rebel easy and confidence-inspiring to ride, in both stop-and-go situations and on the highway, while also returning impressive fuel economy. Prior year model shown. Smooth for comfort: A gear-driven counterbalance shaft helps quell engine vibration for enhanced rider comfort. It's located so close to the crankshaft that the balancer weight passes between the two crank weights to keep the engine as compact as possible while improving mass centralization. Crisp response: Programmed Fuel Injection (PGM-FI) continuously monitors several variables to ensure the correct fuel mixture for the current riding and atmospheric conditions. The system delivers optimal performance and remarkably crisp throttle response over a wide range of operating conditions, plus improved fuel economy. The PGM-FI system also incorporates an Idle Air Control Valve (IACV) to smooth responses to small changes in throttle position. Easy acceleration: The Rebel's six-speed transmission works in concert with the engine's broad powerband to make getting going from a stop easy, while also ensuring strong performance during highway cruising. Prior year model shown. Distinctive chassis design: Combining elements of bobber and chopper styling in its iconic fuel tank design, narrow frame, raked-looking front end and black-out components, the Rebel has a raw, no-nonsense appearance that's bound to get noticed. Comfortable seat height: The Rebel's low 690 mm (27 inch) seat height allows most riders to easily put both feet flat on the ground at stops for added confidence. Want to bring a friend along? The optional passenger seat installs easily. Prior year model shown. Retro look, modern handling: Dual side-mount shocks and the raked-looking fork provide a retro look, but thoroughly modern comfort and handling. Ample range: Chopper-style fuel tank looks compact, but its 11-litre capacity combines with the engine's excellent fuel efficiency to let you ride far and wide between fillups. Prior year model shown.